IMP D and E (Interplanetary Monitoring Platform), AIMP (Anchored Interplanetary Monitoring Platform) were spacecrafts instrumented for studies of interplanetary plasma, energetic charged particles, magnetic fields, and solar X-rays at lunar distances. IMP D (Explorer 33) was a spin-stabilized (spin axis parallel to the ecliptic plane, spin period varying between 2.2 and 3.6 s) spacecraft instrumented for studies of interplanetary plasma, energetic charged particles (electrons, protons, and alphas), magnetic fields, and solar X-rays at lunar distances. The spacecraft failed to achieve lunar orbit but did achieve mission objectives. The initial apogee occurred at about 1600 h local time. Over the first 3-yr period, perigee varied between 6 and 44 earth radii. Apogee varied between 70 and 135 earth radii, and the inclination with respect to the equator of the earth varied between 7 and 60 deg. No data were obtained after 21 September 1971. 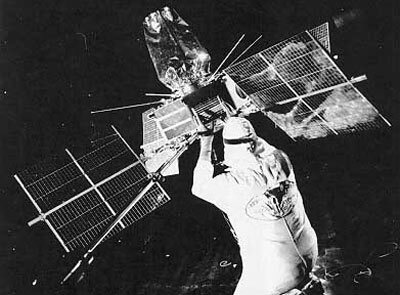 IMP E (Explorer 35) was a spin-stabilized spacecraft instrumented for interplanetary studies, at lunar distances, of the interplanetary plasma, magnetic field, energetic particles, and solar X-rays. It was launched into an elliptical lunar orbit. The spin axis direction was nearly perpendicular to the ecliptic plane, and the spin rate was 25.6 rpm. Mission objectives were achieved. After successful operation for 6 years, the spacecraft was turned off on 24 June 1973.